There may come a time when you need to save or convert a Microsoft Word Doc or DOCX file to PDF format from a Mac. The advantages to saving a Word DOC as PDF are notable in that the PDF file becomes universally readable by any operating system with a PDF reader, even without the Microsoft Office suite, and preserved in it’s original formatting. There are several different methods of saving a Word doc as a PDF, and for converting an existing Word DOC/DOCX file to PDF, both of which use the Microsoft Office Word app on the Mac to get the job done. Let’s review how to perform this action. These tricks apply to all modern versions of Word for Mac, including Microsoft Office 2016 and 2011. This method is quick and easy and will save a new Word doc as a PDF, and it can also exchange any existing Word doc into a PDF file by using the Save As feature. You can also quickly share a Word DOC as a PDF by going to the “Share” menu and choosing to “Send PDF”, which will allow you to email the Word DOC as a PDF file. The freshly saved PDF from the DOC origin is now ready to use in any PDF friendly environment, whether it’s sending it along and preserving the original formatting or posting it online, or whatever else. Another significant bonus to saving or converting Word DOC files to PDF is that you can sign documents in Preview using a Mac Trackpad or apply a digital signature to the PDF with Preview, allowing yourself or a recipient to sign a Word document. This is really helpful for letters and contracts, or any of the other scenarios where you’d like to apply a digital signature to a Word DOC file. Using Export to convert Doc to PDF gives you a few more PDF saving options but is otherwise not too different from using the “Save As” ability. They both work in most situations, but Export is the preferred choice for converting Office files to PDF. 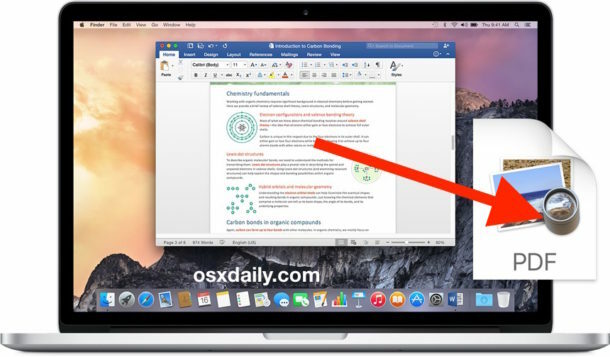 This trick actually works in just about every Office app on the Mac too, including Powerpoint, and not just Word. How Do I Convert Word to PDF Without Office? You can use the PDF saving trick to with just about any document on the Mac, which is part of what makes it such a powerful feature. If you find yourself doing this often, you’d likely want to setup the Save as PDF keyboard shortcut for the Mac, which makes quick work of this task. Can I Go the Other Direction? PDF to Word? Yes you can also go the other direction if necessary, the best way to convert a PDF to DOC file is with Google Docs as covered here. I guess everyone knew about it? No? Although I’m generally a Pages fan, I find it does not do a great job of interpreting Word docs. There’s a big issue that I have been told is common knowledge but there’s currently no fix. When you convert from Word to PDF, the links no longer work. They look like links, but they don’t go anywhere when you click on them. This is only on a Mac. My fix is to create the file in Word, since I know it better, then open the file in Pages, and export to a PDF through Pages. The links then work just fine. If anyone has a fix for Microsoft Word to PDF where the links are live, I would love to hear about it. I’m currently using Microsoft Office 2011 for Mac, which includes Word:Mac 2011. This problem was also present in an earlier version as well. There is an easy way Gillian (I use Office 2011 like you). When you have finished your document in Word hit Command + Print. In the bottom left corner of the print ‘window’ click on PDF and it will drop down; choose ‘ Save as PDF. This will create a PDF with active links. Awesome, thanks so much Ben! I can’t wait to try this! That’s Command + P, not Command + Print. …or just get the free Open Office package and avoid all the above aggro…. For Gillian: In Word [2011 for Mac] select the whole link, press command K, and make sure the ‘link to’ URL is correct. I’ve never had a problem creating PDFs when the ‘link to’ is correct; they always work and go to the correct website or email address. Thanks, Peter! I’ll try this, too. I appreciate it! If you are U.S. government employee or contractor, your pdfs must be 508 compliant for accessibility. In order for that requirement to be met, the pdf must contain properly structures tags which the Windows version of Word does add, but not the Mac version. The only Mac application I have found that outputs tags is the free Office-like Libre Office suite. You’ll need to open the .doc or .docx file and export to pdf and make sure to check the output tags for accessibility box. You can then open that in Adobe Acrobat Pro and remediate the tags. Who cannot open a Word document in 2016? Can’t you just select -P (Print) and then the Save to PDF option? Or is this facility only available on my ageing Mac G4 running OSX 10.2.8 (Jaguar)? Yes you can select print, pdf (lower left of print window) save as pdf for anything. This is common OSX knowledge, and the simplest way to convert anything to PDF on a Mac, has been for decades. Awesomely explained. I am a dummy on a Mac since forever I have been using Windows, and I easily do it there but I couldn’t find anywhere how to do the same on Mac, and this really helps! Thank you!